When going camping or backpacking, you never know what kind of elements you'll encounter. There is a whole line of waterproof hiking gear: backpacks, outerwear, footwear—and flashlights. 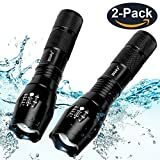 If you get caught in the rain, or if your gear falls in the water, you'll want the flashlight to still work. But there are a number of designs of flashlights out there, with additional features. Here is a guide to some of the best waterproof flashlights on the market. 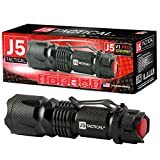 Tactical Flashlights: These are military-grade flashlights, providing powerful light over a wide distance. They typically also have rechargeable batteries. Some of them also have a beveled edge, so that they can even be used as a weapon in certain situations. 2-in-1 Flashlight: These are flashlights that emit a cone of light, but also can function as a 360° area light as well. Spotlight: There are waterproof spotlights available—they can illuminate a wider field of vision than a typical flashlight. Lantern Flashlight: These are held by a handle like an old-fashioned kerosene lantern—but using LEDs, they will provide a lot more light. They can also be collapsible, so they are more compact when traveling. Headlamps: These are strapped onto the forehead. They can have a number of working modes and brightnesses—and can also come in waterproof versions as well. Bike lights: These are headlights for your bicycle—and having them water resistant is a big plus, since you might be riding your bike in the rain. 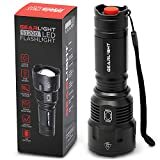 Visibility of the flashlight: People prefer a flashlight with a bright color for its casing, so that it will be easier to find in dim lighting. 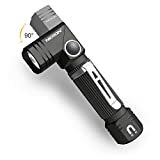 Size of the flashlight: Since you want to be able to carry this with you (everyday carry = EDC) to all different locations, you will probably prefer a flashlight that is compact. Rechargeable: If the flashlight runs on “AA” or “AAA” batteries, you'll have no trouble getting rechargeable ones. But some flashlights come with speical packs that allow you to recharge batteries in a variety of ways, like from a USB port. Lumens and Luminous Intensity: The brightness of a flashlight is measured in lumens. Lumens are a measure of the total light emitted. A small general purpose LED flashlight can be 55 lumens. Bicycle headlamps are over 200 lumens. 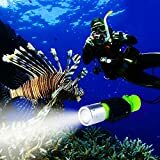 A marine spotlight is 650 lumens. A military-grade tactical flashlight is over 1000 lumens. The luminous intensity is a measure of the flashlight's brightness at the brightest point in the beam. This is an indicator of the flashlight's brightness, independent of distance. Time that the batteries can hold out: This is also known as “run time”. 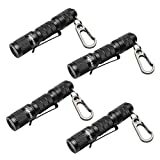 A good 4-LED flashlight can run on three “AA” batteries for 20 hours. Distance that it can illuminate: Household flashlights can illuminate around 50 meters. A tactical flashlight can illuminate as much as 300 meters forward. Water resistant means that the device can be hit with water-- and still be operational. Waterproof means that the device can even be submerged in water and still work. There is an IP code (International Protection Marking) that is given to electric and electronic devices, to indicate how well they can endure dust and water. The first number is the dust-proof rating, and the second number is the waterproof rating. For example, if a device is rated IP65, it has a rating of “6” against penetration of dust. The “5” here is an indication of resistance to water. IPX0 means that the device is not water resistant at all—IPX6 indicates that it can withstand powerful water jets from any direction. IPX7 and upward indicates a waterproof device, that can be submerged in over 3 meters of water. (The “X” in the code indicates that it is not tested in that area. 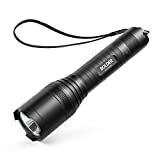 So, a flashlight with the “IPX5” rating has not been tested to be dust-proof, and is resistant to jets of water from any direction (as is the level 5 water resistance)). Flashlights that float: Another feature is a waterproof flashlight that floats. Even if it falls in the water, you don't have to dive after it to go get it. Flashlights for small boats are required to be waterproof and also to float. Vitchelo— is a outdoors gear company based in Houston, Texas, founded in 2014. They make products for camping, hiking, backpacking and swimming. 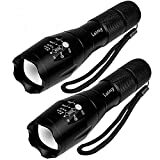 They make several types of flashlights, with many features—dimmable lights, automatic shutoff, etc. Captink— are makers of a number of tactical flashlights. 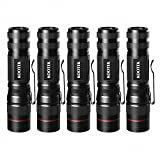 Their flashlights are waterproof and rechargeable, with various modes and focuses for the light. Blitzu—was founded in 2010. They make a wide variety of lamps and lights, as well as compression wear: arm sleeves, calf sleeves, knee sleeves, and compression socks. 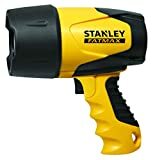 Stanley— now known as "Stanley Black and Decker", is a hardware company that was founded in 1920, merging Frederick Trent Stanley's bolt manufacturing company, and Henry Stanley's rule and level company. Their headquarters is in New Britain, Connecticut. They make power tools, hand tools, home improvement products, and more.